Well it went live yesterday, and if you visited me you would have noticed the new cover in my side bar. Oh I am soo happy that the day has finally arrived. You can now have a look at the new catty, make you wish lists and then get in touch with me. There is soo much I like and I want. We have the new eyelet border punch ( die), fine glitter, more punches and the WORD WINDOW punch, ribbon, glorious ribbon( check that wide stripy out, swoooon), yummy and I mean yummy buttons and tiny clippy things and filigree brads(Oh my!) not to mention white craft ink and KRAFT 12x12 card stock, I said KRAFT card stock people!! ooooh the words pee, pants and excited spring to mind and all in one sentence LOL. Then the stamps, oh the new stamps not all of my favourites made it in but enough to keep me happy for a long, long time did. Oh and did I mentioned embossing buddy? and piercing template? I could go on, but I will stop now and let you find it all for yourself. I am sure you will have a long list by the time you finished and I have something ready to tempt you to place an order straight away. 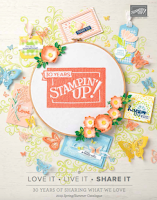 I am giving you the chance to get your crafty mitts on a full set of Stampin'Up! markers. Yes you read that right YOU have the chance to WIN this FULL CASE of gorgeous double ended markers. I am giving this away to ONE person that places a qualifying order with me between NOW and Wednesday 7th of October at 10pm, but that's not all, read on is so very exciting!!! To be in with a chance you need to email me a order of min. £45.00( plus £3.95 postage), I will give away a case for each 11 orders, also with a big order like this come fantastic hostess rewards and I am sharing those out giving you EVEN MORE of a chance to win. For each 11 group of orders I will have the following prizes to give away. WOW what a fantastic offer! 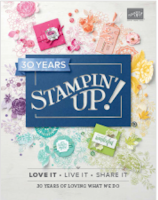 Hi Moni WOW this sounds great - I might just manage to convince myself that I need some new stamps! !